This is the second post in our How Do I Teach... Series. My topic is How Do I Teach a Strong Willed Child, and you can read my Introduction HERE. Already read it, great! You are ready for the next part! Yesterday I gave you a personal example of what happens when a strong willed child doesn't feel respected. In fact respect is pretty much the biggest trigger of poor behavior in the strong willed child. If they feel disrespected in anyway they are very unlikely to do what you ask. Sometimes it isn't even that they don't want to do it, but simply because of the way you requested it. It is frustrating when children disobey, but please remember you really don't want your child to be blindly obedient to anyone older then them. It is good for them to be able to think and make their own choices, but they need you to teach them which choices are wise. They are likely to follow you if they respect you, but the only way to gain their respect is by respecting them! There are a few things you can do to help your child feel respected leading to a better relationship and an easier time teaching them. Let them know what is going to happen. If you have a plan for the day let them know ahead of time! This way they aren't surprised and feel like they have more control in what is going on. Likewise when it comes to misbehavior let them know the consequence ahead of time. They may still choose to misbehave, but they need to be aware of what will happen if they do (more on that in another post). Give them a choice. If you can let them choose. I know this goes for all kids, but choices give strong willed kids the control they need. If they make a choice you really aren't fond of, but isn't going to physically hurt them, stand back. Don't try to make them feel bad about their choice. If there is something you don't want your child to choose then don't offer it as a choice! Tell them why! 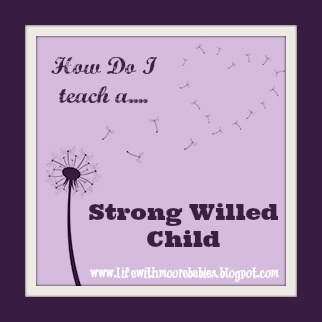 Kids ask a lot of questions, and strong willed kids seem to ask even more! Having the answers can really change the way they look at something. Explain to your kid why they need to behave a certain way rather then just telling them to. Tell them how they make others feel when they treat them a certain way or what will happen when things aren't properly cared for. After all strong willed people in general think rules only apply to people who don't know how to behave, so if they see no sense in a rule, they are pretty much guaranteed not to follow it! Ask them why. If they complain about something ask them why they don't like it. It may be the dress is too scratchy for them to wear or their room is too hot for them to sleep in. Many strong willed kids are actually sensitive to various aspects in their environment. Even though we may not see it at first, these kids usually do have a reason for their protests! We knew early on that our son was strong willed. When he was very little, 2 and 3 months old, he would scream and cry most any time he was inside. The second you walked outside he was calm; walk back in and he would scream even if he appeared to be asleep. For some reason he was particularly sensitive to something in the house. Never really figured out what it was, but thankfully he got over it before winter came! However, his strong will shows through even more as a two year old! Ask if it is okay. It is amazing what a little question like "Okay?" can do for these kids. The reaction you get from saying "we are picking up toys and then we will eat lunch" versus "we are picking up toys and then we'll eat lunch, okay?" is drastic. That one little word gives your child a chance to say no. I know that sounds counter intuitive, but giving them an out or a way to explain themselves before the tears start is a much better option for everyone! If they have a problem with your plans, you can resolve it immediately rather then fighting them because they don't want to pick up the blocks before their building was finished. You ask okay, they tell you they aren't finished, you come up with a suitable solution like they finish their building then put blocks away or they clean up everything but the blocks and come back to them later. Many times when you show your child that you do indeed respect their opinion with this little question they will be perfectly happy to do things your way. I know many of you may be thinking that you shouldn't have to ask because you are in charge (maybe you are strong willed like me if you are); I mean these are kids you are dealing with not adults! But I promise with these kids a little respect goes a long way! Besides you really are raising adults! 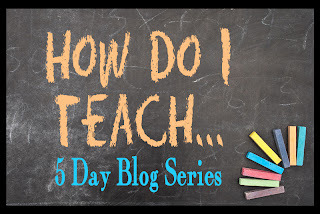 Have you checked out the other blogs particiapting in the How Do I Teach Series?